Jan Ullrich, who pulled out of the Giro d'Italia last week complaining of a back injury, will next race at the Tour of Switzerland, starting a week from Saturday. Ullrich has long preferred the 9-day Swiss race to the Dauphiné Libéré as Tour prep, and this year, he'll be joined by T-Moble Tour squad compatriots Michael Rogers, who also abandoned at the Giro, in his case for a severe toothache, and Andreas Klöden. Saunier Duval-Prodir's Chris Horner took a big win today at the Tour de Suisse, finishing 1:12 ahead of Fassa Bortolo's Vincenzo Nibali. Race leader Jan Ullrich finished 1:48 back, so Australia's Michael Rogers, who finished at 1:14, takes over the race lead. Horner rode with neopro Nibali, who snapped free of the peloton on the day's last climb, looking very strong. Apparently, Nibali wasn't quite as strong as the force of his escape made him look, and Horner couldn't get him to pull through on the climb. Eventually, harsh words were exchanged, with Horner making the universal "come on by" gesture used for wheelsuckers everywhere. When Nibali wouldn't, or couldn't, produce a strong pull, Horner dropped him hard. Horner's victory is his first in Europe, after three unsuccessful years with Française des Jeux from 1997-1999. Over the years, he has won pretty much every US race but the USPro championships. Horner said he was able to make his break work because he was three minutes down on the GC leaders, and couldn't see any of them spending the effort to try to pull back a rider that far back. Now that he's sitting 6th overall, at 1:31, the escapes aren't likely to come so easy. The win will strengthen Horner's case to make Saunier Duval-Prodir's Tour de France team. Friday looks like a final day for the sprinters before two mountain stages to close out the tour. With a veteran's tactics and the heart of a rookie, American underdog Chris Horner (Saunier Duval - Prodir) picked up his first major European victory Thursday, crushing the competition in the mountainous sixth stage of the Tour of Switzerland. "I'm sorry I don't know the names," Horner said when an Italian reporter asked about the several riders he had dropped on the final climb. "This is only my eighth - wait, my fifth - race in Europe." Michael Albasini of Liquigas-Bianchi took his first pro win at the Tour of Switzerland today, outsprinting the rest of a seven-man break that rode a 130-km breakaway. "I'm very, very happy because my first victory has also come in my home race," Albasini said after the finish. "I started my sprint a little bit early and thought I might not win but I managed to hold on." Davitamon-Lotto and Quick Step tried to close down the escapees to force a field sprint, but the break conserved 38 seconds. Jan Ullrich holds the leader's jersey for one more day, but his lead may be threatened Thursday as the race hits the mountains. 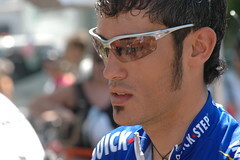 Freire, who had a terrific spring campaign, will also pull out of the Tour of Switzerland before tomorrow's stage start. Ullrich: "I am almost at my very best"
T-Mobile's Jan Ullrich says he's very happy with his condition with three weeks until the start of the 2005 Tour de France. "Let's not get ahead of ourselves. There are a few more mountain stages [at the Tour of Switzerland] that will help me gauge my true form." "But what I can say for sure is that two weeks before the start of the Tour, I am very close to my ultimate fitness level. By the end of the week, I'll know if everything is already perfect or if there's still a detail or two to tweak."